As we dive into fall, there is almost nothing better than the smell of fall flavors cooking on the stove, permeating the air throughout the house. Let's pause for a minute and try to imagine the smell of apple cooking in maple syrup, cinnamon, ginger, and nutmeg--it smells just like an apple in the oven. Is your mouth watering yet? Because mine is. Whenever I'm cooking something as fragrant as this, there's nothing I'd like more than to share the smell with my friends. I seriously wish someone, one of these app geniuses out there, would just invent an app to smell and taste food through the phone. I mean, come on, how hard could it be? There's an app for everything else... It needs to happen one day... Life changing. Anyway, back to these scents... I find so much comfort and warmth in the smell of fall foods cooking in the kitchen and this Apple Pie Oatmeal perfectly epitomizes my idea of fall flavors. Aside from the fact that it’s delicious, I’d make it just for the smell. In fact, I will. Be prepared to see more recipes with this apple pie goodness. 4 5 mins. 25 mins. 30 mins. Bring 4 cups of water to a boil in a medium saucepan. Stir in steel cut oats, cover and reduce heat to low. Simmer, stirring occasionally, for 25- 30 minutes until the oats are tender and the water is mostly absorbed. Stir in 1 teaspoon of cinnamon until combined. While the oats are cooking, peel apples and cut them into uniform half-inch dices. Combine apple chunks, maple syrup, ½ teaspoon cinnamon, nutmeg, ginger and pumpkin pie spice in a small saucepan over low heat. Cover and cook for 25-30 minutes, stirring occasionally, until apples are tender. 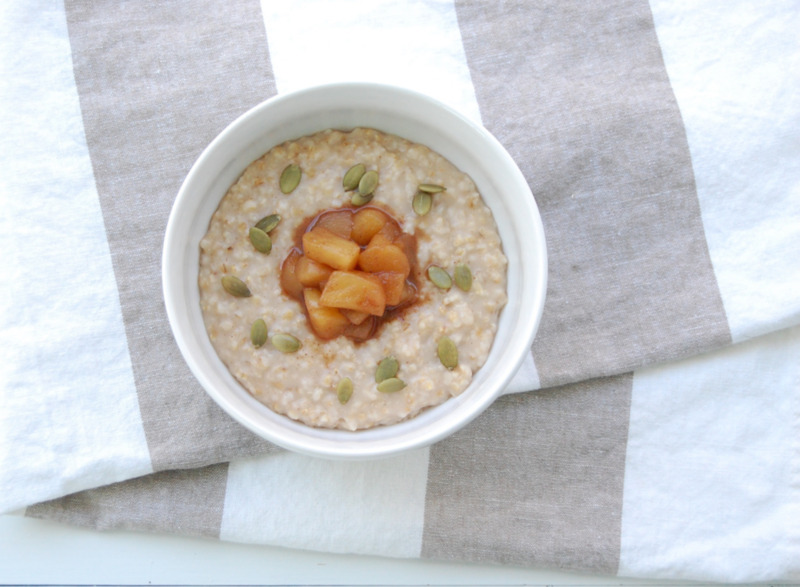 To serve, spoon oatmeal into a bowl, top with a spoonful of apples, and pumpkin seeds, if desired. Let your toddler sprinkle the pumpkin seeds over the oatmeal! They can also help with measuring out the spices and sprinkling them over the apples before they're put on the heat.